Comfortable free standing villa with neat well kept interior, located in the peaceful villa neighbourhood of Serra Brava. The house nestles against a mountain; a magnificent spot with superb views over the hills, ocean and the lovely bay of Playa de Canyelles. The extensive garden (700 m²), terraced with rock walls, has been tastefully landscaped in the Spanish style, with details such as sculptures, flower beds and terracotta pots filled with pretty plants and flowers. Venturous children can amuse themselves in the garden with its fine lawn, plenty of greenery and even a small water feature with a bridge. Naturally there is also a private swimming pool with an outside shower. Enjoy the striking wall paintings too. The large patio, which also has the most beautiful views, is equipped with exterior lighting and garden furniture. The friendly owner sometimes stays in an apartment below the villa, with its own entrance and private area. 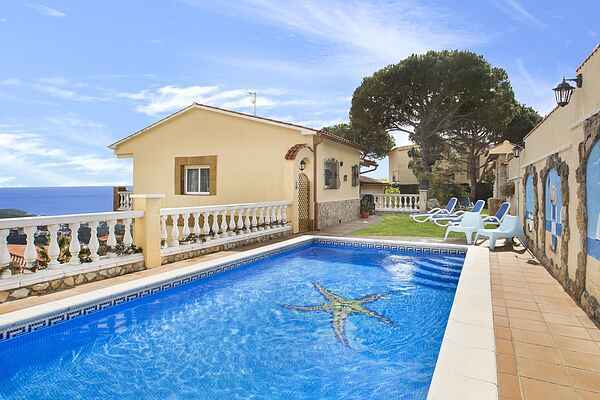 All our villas in the Lloret de Mar area are quietly situated, against the mountains in the hinterland. Ideal for complete relaxation. If you are seeking entertainment, Spain's most visited tourist spot can be reached in no time: the attractive city of Barcelona is close by (70 km). Nearby is the lively city of Barcelona (70 km).